EVERYONE USES SWEETENERS. NO ONE WANTS TO BE LIKE EVERYONE. Our Sweeteners, Your Concept, Endless Possibilities. NATURAL. ARTIFICIAL. NUTRITIVE. NON-NUTRITIVE. 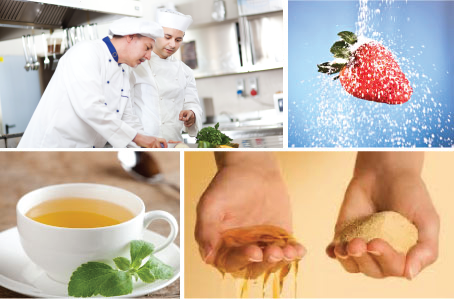 NOVEL; ChemPoint's sweetener offerings can help you enhance your product flavor profile, change or improve the health benefits and claims, provide cost savings and strengthen your retail marketing or brand... the possibilities are endless. Food and Beverage formulators no longer have to choose one type of sweetener to the exclusion of others for their formulations. Increasingly, product developers are giving up their quest for an alternative sweetener that by itself can solve all the functionality challenges related to a particular formulation. By doing so, they are freeing themselves to create better-tasting products using sweetener systems that offer improved functionality while helping to address obesity, diabetes, and other heightened health concerns. Synergy is defined as occurring when the sweetness of a mixture of sweeteners is greater than the sum of their respective individual sweetness intensities. When working with sweeteners, formulators must not only consider the right amount of sweetness, texture, flavor and appearance that the blend contributes to the food or beverage product, but also what potential health benefits, marketing or cost savings are provided.